We’re always impressed with creative design reuse, but this children’s playground made from recycled shipping containers takes the cake for one of the most imaginative examples of shipping container architecture we’ve seen. Known as the Skinners Playground, this kidscape puts four discarded shipping containers to use as the primary spaces for childhood adventures. Designed by Melbourne-based Phooey Architects, the children’s activity center reconfigures the containers, as well as plenty of other recycled and salvaged materials, into a fun-filled park for the young imagination. Many of the structural elements in the Skinners Playground are simply container cut outs that have been repositioned. The stair railings, shade overhangs, and balconies are all parts of abandoned containers. The materials are left with tell tale signs of origin, giving a feeling similar to kid-constructed tree houses and forts from found objects. The windows, carpet tiles, and fasteners at Skinners are also on their second life, reclaimed from the waste stream to bring function and fun to the playground. Through the architect’s zero waste approach, Skinners Playground proved to be an economically sound endeavor, as well as environmentally friendly way to bring recreation into the backyard of kids living in South Melbourne. Even though architect-designed, the program at Skinners is kid driven, with local children adding touches like hand-painted murals. This architecture is named as Cargotecture . and according to my view , the main and the most important feature of this type of architecture is that they are earthquake proof buildings . I just saw this while I was studying architecture abroad in Melbourne. It was amazing to see such a great example of green design, even though its quite tucked away and doesn\\\'t allow adults in without children. This is so awesome! There is nothing more exciting then seeing people build a new structure out of old materials- especially ones people usually consider "ugly". We're always impressed with creative design reuse, but this children's playground made from recycled shipping containers takes the cake for one of the most imaginative examples of shipping container architecture we've seen. Known as the Skinners Playground, this kidscape puts four discarded shipping containers to use as the primary spaces for childhood adventures. 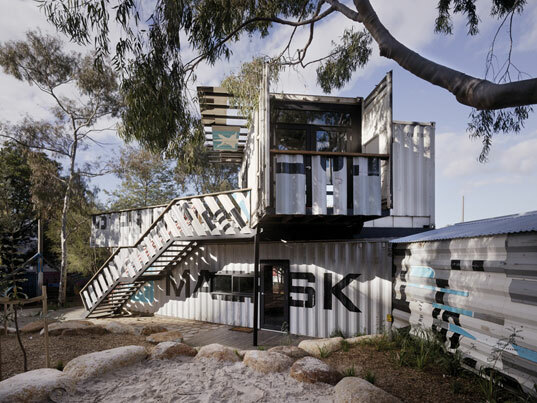 Designed by Melbourne-based Phooey Architects, the children's activity center reconfigures the containers, as well as plenty of other recycled and salvaged materials, into a fun-filled park for the young imagination.